Community. Fellowship. Cheerer-on-er (a technical word). All of these words come to mind when I think about all of YOU who have circled around us this last year in particular. Even though many of you have never walked this path, you join us on this trail, cheering from the side, often times stepping in and helping us as we run the race laid before us. The ways that you have rallied behind us may seem small to you but have literally helped carry us from one mile to the next. Texts. Cards sent to our home. Flowers sent. Chocolate covered strawberries received. And now, we hit a big mile marker. We are (hopefully) gearing up for the last leg of the race. Your support now, more than ever, will continue to keep us going. Suppression – Our current phase! This is where we are suppressing my ovaries with medications to ensure everything is “quiet”. With an IVF cycle, everything is monitored and carefully manipulated to ensure the best eggs and outcome happens. The Suppression phase for me started back in March when I was placed on birth control pills. This way the doctors can control the hormones my body has in it and it prevents untimely ovulation. Next Wednesday, the 17th, I begin another added part, which is a daily injection of a medication that slows down and stops my pituitary glands from producing LH and FSH. (Again, just fancy names for the hormones that make someone ovulate.) So essentially this stage is shutting down my system in order to gain complete control during the Stimulation phase. I will be on the shots, called Lupron, for a total of 10 days. These shots are done in the mornings and were physically pretty tough last cycle. Again, I feel like I know to expect to feel crappy so it makes it easier. It’s exciting to feel crappy when the potential is having a baby!! (But I do sleep a LOT, the mood swings are difficult, and nausea, headaches, hot flashes and exhaustion are typical). Embryo Transfer – Typically 5 days later, we go back in for the embryo transfer. At that point, we meet our babies, our doctor recommends the strongest one/ones to transfer and we have the exciting experience of watching on screen as our babies get moved in my uterus. It is SUCH a special moment for Josh and I – we fell in love immediately last time and I don’t doubt anything less this time. Waiting – Back on bed rest! Now we pray. We pray A LOT! In the next 48 hours following the transfer, it is now up to our babies to implant themselves into the lining of my uterus and hopefully make themselves at home for the next 9 months. Last cycle we transferred 2 embryos and assuming all goes well, hope to do 2 again this cycle. We had 1 embryo left that we froze and hope to add more this cycle, so that we can someday do a Frozen Embryo Transfer (FET for short), where we can skip over the Stimulation phase and Retrieval phase and just transfer my embryos. We wait 2 weeks until we have some blood work done to see if my hormone levels indict levels that confirm a pregnancy. You know what’s crazy? That by the end of next month I will know if I am pregnant or not. I PRAY that I am but if I am not, we will immediately launch into an FET (frozen embryo transfer) cycle. I am feeling so encouraged and blessed and READY to THRIVE again in this cycle (not just survive). Please continue to join us though, cheer us on, pray for us, and make a figurative poster at big mile markers. I can’t even begin to tell you how much the excitement of others helps us stay in the moment. Any help, words of encouragement, and prayers you can spare is amazing. So, this is it! The home stretch! I am turning a corner – 5 days left to work. All of my medication has arrived (see picture below) and I have started sorting it out and ensuring all of the vials and syringes are ready. I am EXCITED and praying against nerves of the unknowns. I don’t want to end up in the ER again. I don’t want anything unplanned to come up, like follicles that get too big, or a suppression phase that doesn’t work. Please join us in praying against the unknowns. The IVF journey isn’t easy to begin with and I feel blessed to know what to expect this time around…really hoping to keep it that way. Once I am done with work, I intend to be really good about blogging at least twice a week and updating everyone on how the cycle is going and how to be praying specifically. Don’t be shy in reaching out and checking in as well. I really do love that. This is physically and emotionally draining on me BUT I have such a rock in Jesus Christ. I realize more and more each day how we are fearfully and wonderfully made. We are so complicated and I am blessed that through the use of modern day medicine, we are able to receive the help we need in order to have a child. I know that even though the chances of us creating a baby from one romantic, magical evening is slim, God is just as much in the creation of our child/children through the use of IVF. At the end of the day, He is the Creator, the Sustainer, the Provider and Protector, and the peace we have truly surpasses all understanding. “If God’s hadn’t been there for me, I never would have made it. The minute I said “I’m slipping. I’m falling.”, your love, God, took hold and held me fast. When I was upset and beside myself, you calmed me down and cheered me up.” (Psalm 94:17-19) Had I not miscarried last cycle, I would have been about 20 weeks along. But then I also would never have the chance to be part of creating these new little miracle, miracle children that God-willing will one day be held in our arms. Ok, long post. Lots of details. I am sure fellow IVF’er are cringing with the summary as I tried to make it all less medical. Please feel free to ask any questions you may have! I love sharing in this journey with you and having you along for the ride. This will be one amazing celebration one day. The medications used for this next cycle! Shots, pills, suppositories, patches, more shots … all blessings! Praying for you SO MUCH as you get started again. (And great explanation in lay(wo)man’s terms, by the way!) I look forward to hearing the updates. And enjoy that last week of work! Thank you thank you thank you! I appreciate all your prayers and am glad you liked the basic explanations. :) I love following your story as well! Best of luck, I am praying that this will be your cycle!!! I think it’s great that you break every step down and explain everything so thoroughly. Sometimes we forget that others may have no clue what we are talking about, we have to know because all of these terms have become our life, it’s great to explain it so everyone knows what will be happening! 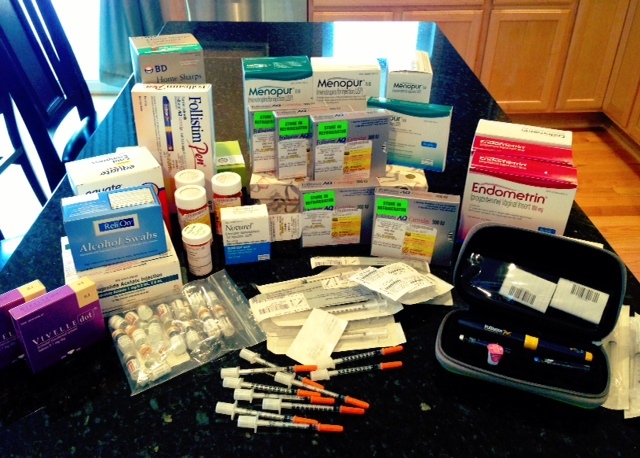 Having done IVF, I shouldn’t be so shocked by that pile of meds, but sometimes it’s just crazy what we have to go through! I’m so glad that you’re feeling supportive. That’s a really crucial part of this process. Yes! And so much support comes from people like you! Relative strangers who have tagged along, reading and praying, commenting and cheering. THANK YOU for the support! Eck! It’s here! Thanks for the support dear!